Scott #35, 1922 1sh bister. Used VF. Scott #72, 1922 5p violet Sword of Light. Used F-VF. 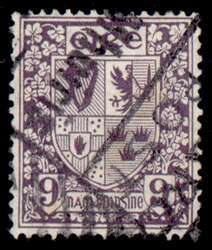 Scott #74, 1922 9p violet Coat of Arms. Used F-VF. Scott #74, 1922 9p violet Coat of Arms. Used VF. Scott #76, 1922 1sh light blue Sword of Light. Used F-VF.